Several years ago, I began a travel board as a way to document our travels over the years. So far, we have traveled to 13 states. The majority of the photos documenting the first time we had been there together. I love the idea of watching ourselves get older as we explore more of the country and add photos to the board. Our goal, of course, is to hit all 50 states, including D.C. It is definitely one of our favorite pieces we have in our home and it gets a lot of comments from family and friends. Below is the step by step process to make your own! Trust me, it's easier than you think! Ed Note: Make sure to take opportunity to measure the states before you print photos. States like Texas and California are likely to require a larger photo printed. 1) Cut out the map. 2) Paint the bulletin board. Let it dry. I chose black for a neutral background. 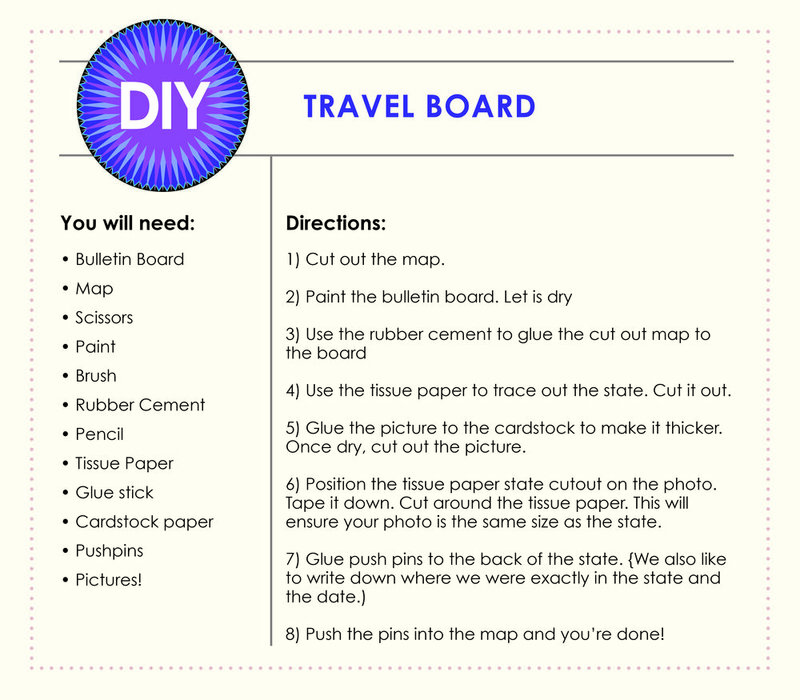 3) Use the rubber cement to glue the cut out map to the board. 4) Use the tissue paper to trace out the state. Cut it out. 5) Glue the picture to the cardstock paper to make it thicker. Once dry, cut out the picture. Position the tissue paper state cutout on the photo. Tape it down. Cut around the tissue paper. This will ensure your photo is the same size as the state. 8) Push the pins into the map and you're done! I hope you take the time to try out this DIY! It's an ongoing project that inspires Steve and I to travel and explore! P.S. If you liked this, than you will also like Not Your Typical Headboard and International Shadow Boxes. Today, I am introducing a new series to Kaleidoscope Spinning: Home Envy. Here, we will take a look at the interiors of beautiful homes. First up Sutton Foster's Dressing Room. Okay, so I know it's not officially a home, but as the article reminds us, a dressing room can be the second home for an accomplished actress/singer/dancer. The beauty of this space is bright and colorful decor, mixed in with the practicality of the furniture. Isn't it all gorgeous! Give me inspiration for my own living room. My husband instilled something in me when we first moved in together. At the time we were recent college grads and newly engaged, and I wanted this first apartment of ours to look amazing. My instinct was to go to Target and buy wall décor to fill space and cover our ugly beige walls. But Steve stopped me when I was discussing my plans. He told me how he prefers the décor in his home to be personal. Rather than picking up items because they "looked cute", he wanted to have items I created or prints that had meaning to them. With this in mind, I abandoned my original plans and took a look at what we already had. A few worthy item according to the new criteria and some obvious gaps that needed to be filled. Given how I now wanted everything to have meaning, I didn't rush the process. It's now been three years and we've gone through 4 versions of our gallery wall. I think this one is the best by far. In those three years, I've added items and taken some away, but the purpose has always remained the same. #Stelen2015 was our wedding hashtag. Inspired by the "celebrity name" given to us in college (Steven and Helen) and the year of our marriage. The Stelen2015 canvas was a wedding gift from a sweet college friend. A Valentine's Day gift from me to Steve, in the middle is a photo from the first time he visited me and my family in Chicago. Around the photo, I wrote the lyrics to "Crazy Girl" by the Eli Young Band. We considered it our song and eventually had our first dance to it at our wedding. Another gift from me to Steve. I took a wooden plaque and hammered in nails in the of the state of Iowa. The heart was placed in the center for the location of Iowa State University in Ames, where Steve and I met. A print from an Etsy shop. I originally was planning on purchasing one for some friends, but I felt it applied to Steve and I as well. In his job, he travels at least once a month, but usually more. Steve was also grew up moving every other year because his dad was in the Air Force. Because of this he believes in taking advantage of living in new places. A gift from Steve to me on our very first dating anniversary. The frame, from an Etsy shop, says. "I Love You to the Moon and Back". The photo contains a picture of us a couple of days before our first date and a photo a us exactly one year later. A photo from our engagement shoot. The Kansas City Skyline print from Etsy. When we moved to KC, I wanted to buy a bunch of KC artwork to commemorate the move. The Skyline is made up of words that have to do with Kansas City. A print we picked on our honeymoon in Antiqua. It is of a part of the island that holds the National Park. A gift from Steve to me. It says "Steve Lassos to Moon" with a image of a man actually lassoing the moon! He gave this to me because "It's a Wonderful Life" is one of my favorite movies. But the best part? It's not a print, its all sewn onto a canvas! An abstract map of Ames, IA. The cutest little print I picked up from Paper Source. This is actually a lawn sign from Iowa State's 100th Homecoming celebration. Steve and I were both on the committee to plan Homecoming that year. A photo of the Northern Lights, taken in Alaska, which is where we picked it up. If only I had seen them myself! Yes, that is a very tiny photo from our wedding, but we have much bigger ones in our living room! Another photo from our engagement shoot. This is a fun little item. I took the top off of a shadow box and left the glass and backing on. This is where we put old tickets from concerts, movies, and games. I hope you enjoyed taking a look at our gallery wall and learning a little bit more about me, and my life! P.S. You may also like Not Your Typical Headboard and International Shadow Boxes. Today, I am inviting you into my guest bedroom/office/sewing room/storage room; aka the room every else goes into. It was the last room to get set up after the move, mostly because I deemed it all storage until last week. But my in-laws were coming into town, so I hunkered down in that room and organized. I managed to fit everything, much to my surprise! But once I was done, something still was missing. The walls were bare, the room lacked color, and the bed had no headboard. I wasn't planning on buying a headboard for this bed until we moved into a house. I stood by this thought, but that didn't mean I couldn't add something. I had this DIY project in mind for some time now, so I decided to give it a try! The best part, it would solved all my problems. It would cover one wall, add color, and give the bed a headboard. All for about $50 and a little time. Below is a step by step guide and pictures of my process. If you have any questions about the process, or need clarifications please leave a comment down below. And if you give this DIY a try, I'd love to see! Post a picture on Twitter or Instagram using the hashtag #KSDIY. My dog, Dakota, seems to approve!